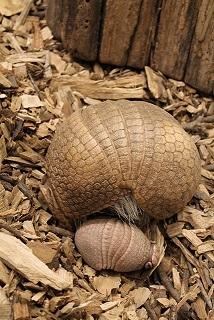 May 29, 2015 (Topeka, Kan.) -Your Topeka Zoo is very pleased to announce the birth of a new baby southern three-banded armadillo. Born on Tuesday, May 5, 2015, the currently unnamed pup and both parents are doing wonderful. The mother and pup are currently off exhibit and enjoying their peaceful time together. The first several weeks of life are critical for both the mother and the baby. The staff at the zoo has been very careful to give them their space and let this be a joyous time for everyone. The parents Erin and Mulligan, have had two other offspring already that have found homes at other zoos across the United States. The successful pairing of the two was done as part of the Species Survival Plan, a program within the Association of Zoos and Aquariums that oversees breeding to insure each species survival and that people can enjoy their continued existence for generations to come. "We are joyed at the new addition and of the success of the program. Each successful breeding from animals at the zoo is an accomplishment and proves that these programs are working and necessary," stated Brendan Wiley, Director of the Topeka Zoo. "The staff is overjoyed and have done a great job in caring for the mom and little one while giving them their space as well. A healthy addition is always a happy addition". 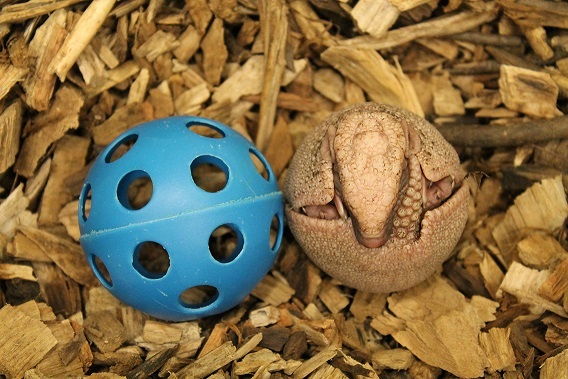 Armadillos are known for their armor-like dermal plates that go from their heads to their tails. Baby armadillos grow very quickly and by the time they reach five weeks old, have already grown almost five times their birth size. Before they are even three months old they are weaned from their mothers and go off to live on their own, almost fully grown.